ECOMM CURRENT OPENINGS: Opening For CRM (In Office work) in Howrah - Kona Expressway in Jewellery Sector. 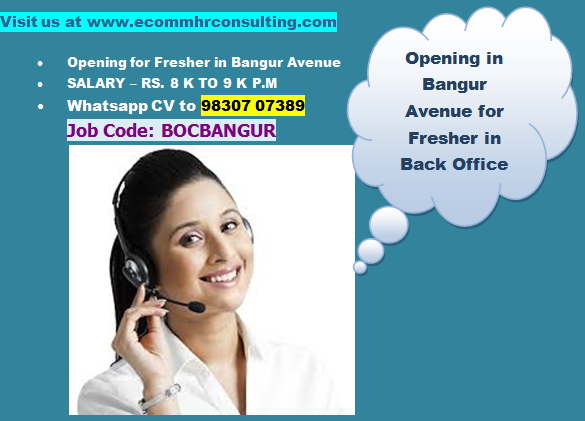 Opening For CRM (In Office work) in Howrah - Kona Expressway in Jewellery Sector. Office Location: Howrah - Kona Expressway near Kona Railway Station. QUALIFICATION : Any Graduate must be fluent in English. SALARY : RS. 15000/- TO RS. 20, 000/- Per Month. COMPANY PROFILE : Manufacturers of Jewellery. Travelling Allowance or Transportation Services may be provided. Medical Benefits are also provided after a Job Tenure of 4 months. Promotion and Increment Prospects are there for Candidates who are result oriented. Customer relationship managers should know their customer's needs, wishes and dreams. The candidate should be well versed in the value delivered to customers and the problems customers are trying to solve. The candidate will not only solve customer requests but will offer ideas and insights to improve the customer's issues and challenges and will follow up on every issue and ensure complete satisfaction and maximum utilization of the product or services sold to customers. Must possess an attractive personality.